Netflix’ strong 2018 results show the money the company is pouring into content is paying off. To illustrate how the strategy is working, executives trumpeted the company’s star-making power. They also suggested those without Netflix are outside the zeitgeist! The number of Netflix customers (free and paid) increased by 36% in 2018 to reach 148.5 million. The number of paying customers increased 26%, to 139.3 million. U.S. growth remained strong, with paying customers increasing 11% to 58.5 million (61 million with free-trialers.) International growth also remained strong, turning in another 40% increase to reach 80.8 million paid customers (87.9 million including free-trialers.) Annual revenue also showed strong growth, increasing 35% to reach $15.8 billion. Netflix is forecasting slowed growth in Q1 2019. The company anticipates growing subscribers 24.6% year-over-year (YoY) versus 26% one year ago. The price increase in the U.S. – $2 a month more on the most popular plan – could be the reason the company lowered its forecast. However, most analysts, including those at nScreenMedia, do not expect the price increase to impact Netflix’ growth in 2019 materially. Why are analysts so bullish on the company? The massive content spending is delivering big growth for the company, and in 2019 Netflix shows no sign of slowing its content spend. Netflix went to great pains in the quarterly financial call to emphasize how well it is spending the money. In the quarterly shareholder letter and the quarterly results call, Netflix executives took time out to illustrate the power that comes with having nearly 150 million customers. The shareholder letter was more specific about Netflix’ star-making ability. It cited the impact being in a Netflix production had on actors that were previously little known. 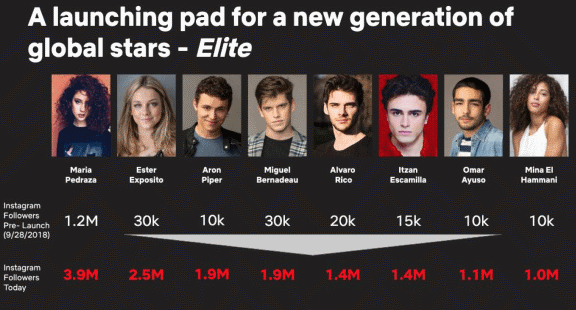 For example, over 20 million-member households around the world watched the Netflix Spanish original Elite. 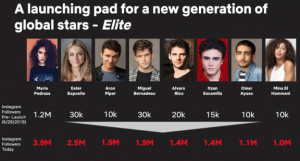 One of its stars, Ester Exposito, had just 30,000 Instagram followers before the launch of the show on September 28th, 2018. Ms. Exposito now has 2.5 million followers. Netflix shows no sign in letting up on its massive spending on content. With Disney and WarnerMedia entering the market at the end of the year, now is not the time to be trimming spending. Moreover, while the spending keeps delivering 26% growth in paying customers, there is no reason to stop. 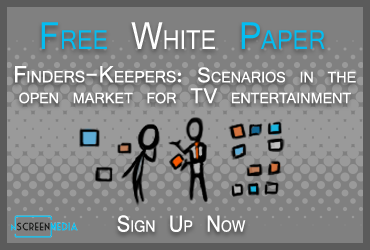 One area where the company is increasing spending is in co-production partnerships with local broadcasters. Mr. Sarandos said that last year 140 shows premiered in a local market with a local producer and premiered on Netflix in the rest of the world. The number of shows like that will grow to 180 in 2019. As an example, he mentioned The Bodyguard, a partnership with ITV and BBC in the UK. The show premiered on British TV on BBC One and released as a Netflix Original Series at the same time in the rest of the world. Star Trek: Discovery is another example. It premiered in the U.S. on CBS All Access and in the rest of the world as a Netflix Original Series. All of this means Netflix subscribers will continue to find plenty of new original shows for at least the next year or so. Netflix continues to grow strongly, even in mature markets like the U.S. The growth is due in large part to the huge amount the company is spending on content. The company went to great pains to emphasize it is spending its money wisely.